The streets and byways of Chiang Mai teem with abundant wonders. Vibrant temples, markets, and cuisine beckon your attention. Some sights will make you laugh and smile. Others bring a tear to the eye. All will deeply impress your mind. The city walls were built at the time of the city’s founding. 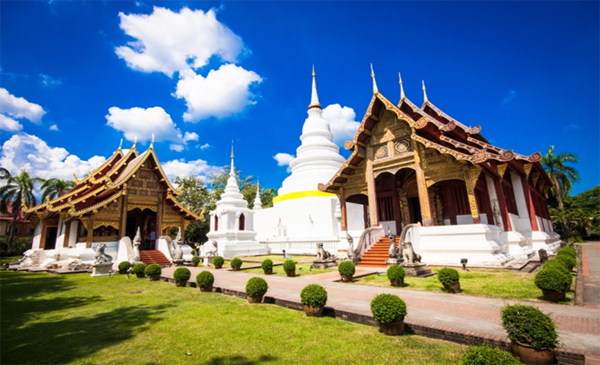 Like other cities of the period, Chiang Mai was built according to traditional astrological and religious principles. This meant that every aspect of the city’s layout, including walls, gates and moats, were designed to appease spirits and gods so they’d protect the city. Here are some suggestions for making the most of your self-guided tour. 1. Grab a map from your hotels concierge or view our travel map and walking tour section. 2. Dress in clothing appropriate to temple visits, covering the arms and legs. Wear comfortable walking shoes. 3. Bring bottled water to keep well-hydrated. 4. Offer gifts at temples. Suggested alms are food, flowers, and money. 5. Don’t plan to do the tour in one day. Allow time for impressions to settle in your mind and heart. Before entering a temple, remove your hat, sunglasses, and shoes. Turn off your mobile phone. When greeting and bidding a monk good-bye, assume the respectful “wai” position. Place your palms together at chest level, close to the body. Lower your head until your thumbs touch between your eyebrows. At the same time, bow slightly. Understand that monks traditionally do not return a wai. Most temples have metal donation boxes to receive monetary gifts. A typical donation is 20 baht. This landmark honors the three kings who founded the city centre. Behind the monument is a white building known as the City Arts and Cultural Center. Inside, you can see a brief video on the history of Chiang Mai. 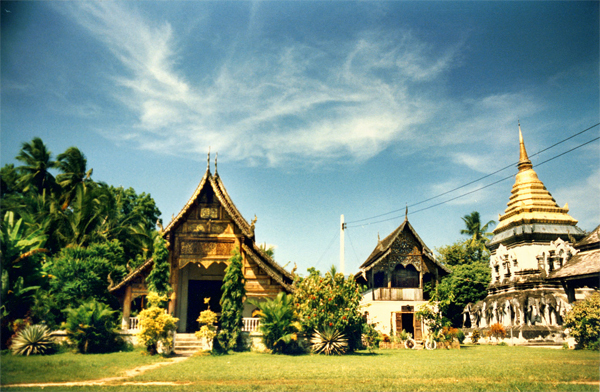 The first floor has displays on the culture of northern Thailand. The second floor has rooms simulating an early Lanna village, temple, and train car. On the south side of the courtyard is a brown teak wood temple trimmed in gold. Known as the Temple of the Navel of the City, it is the former site of the original city pillar. This was the first brick pillar erected when the city was founded. Alms are offered to young monks at this site at approximately 6:30am. Suggested gifts are fruit, flowers, food, toiletries, and money. A moving experience is seeing residents present flowers, candles, and incense at the monument to receive blessings from the kings. This is a school for young Buddhist monks. A compelling sight in mid-morning is the sea of orange-clad monks making their way to school. 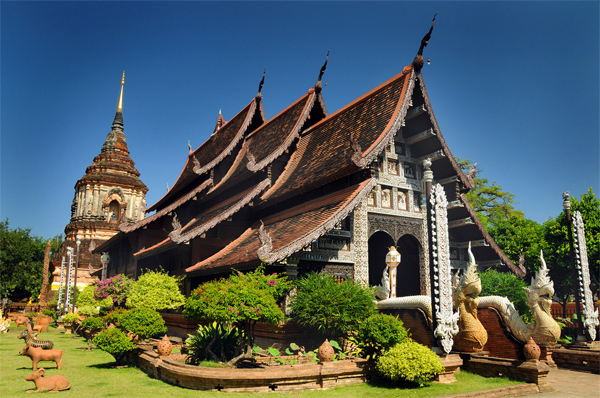 This is the oldest temple in Chiang Mai, built in 1296. It houses two revered Buddha images. One is made of marble and the other consists of crystal. Both are approximately 2,000 years old! The temple grounds include a chedi, a domed-monument, supported by 15 elephant statues. 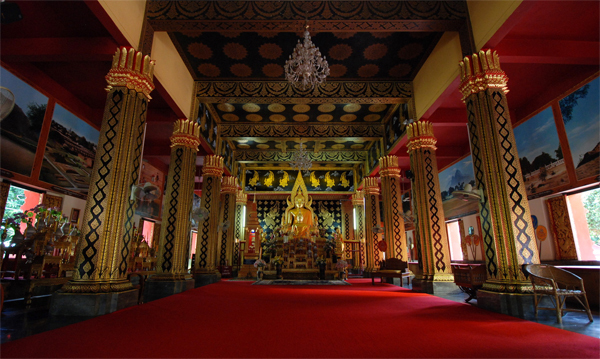 Within the main hall are red and gold murals depicting the life of Buddha. The outside of the hall has windows repeating the same red and gold theme. A serene garden surrounds the temple complex. Also known as the North Gate, this is the portal to Chiang Mai and part of the original moat wall. For hundreds of years, the gates of the wall were locked nightly to protect the city from assault. In 1941, Japan invaded Thailand. Though the fighting was fierce, the resistance lasted only a few hours before ending in a ceasefire. The moat wall stands 15 feet tall. 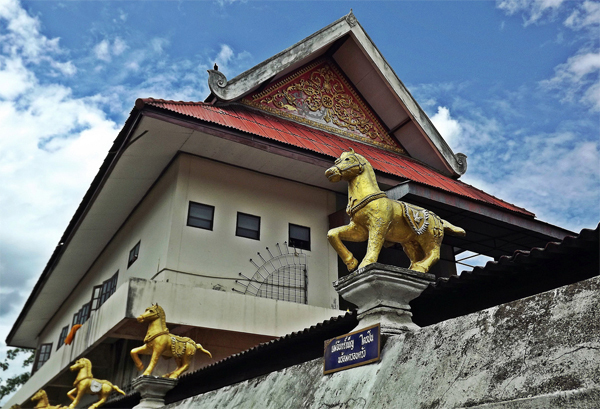 Mounted on the wall surrounding this temple are 50 golden horses! Stepping inside, you’ll be greeted by more animal statues, symbols from the Chinese calendar. 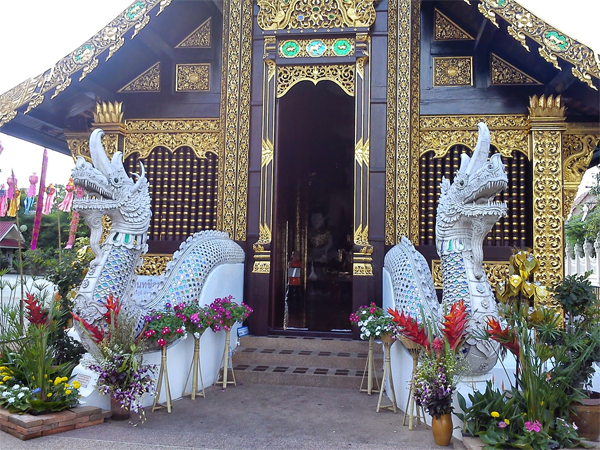 Gold serpents line the steps to this elaborate temple. To the left is an immense yellow Buddha seated on a red platform. The upper floor of the temple has a grand hall with another golden Buddha in regal garb, flanked by maroon columns. Surrounding the complex are spires in burgundy and gold. Unique to this temple compound is a variety of animals posing on the grounds. Included in the menagerie are a zebra, lion, ram, rabbit, and horse. The two-tiered roof slopes dramatically from peak to eaves. A metallic tree shimmers with golden leaves. A pond features statues of Hindu gods. The compound was constructed in the mid 1300’s. It was initially used as a royal palace. This is a private estate with two massive structures. The three-story mansion is framed with towering white columns and stained glass windows. Two huge lions guard the entrance. A blue-tiled pool curves around the foundation. Behind the manse, a mammoth white castle is a fusion of architectural styles. Marble blocks mingle with pillars and statues of Roman gods. Spread-winged eagles perch at the base. Cherubs in crèches crown the roof. This is another part of the moat wall surrounding the city. Have fun strolling the top of the wall and viewing the moat below. When you get to the far corner, you’ll see an alcove where a watchtower once stood. This is an active temple where hundreds of monks and novices live. 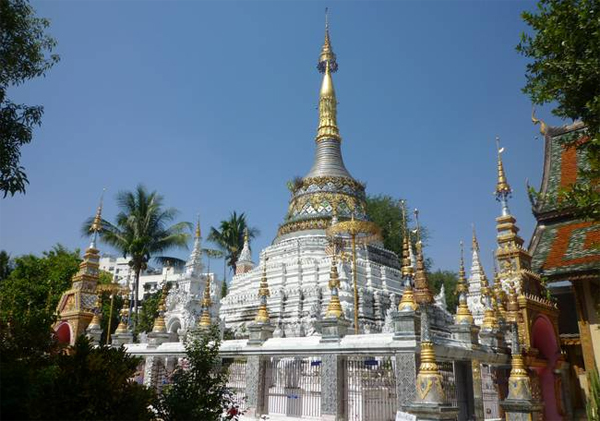 The complex includes two pagodas and a white-domed chedi between them. To the right of the dome is an ordination hall housing a reclining Buddha. The scripture library soars high into the sky from a lofty white platform. 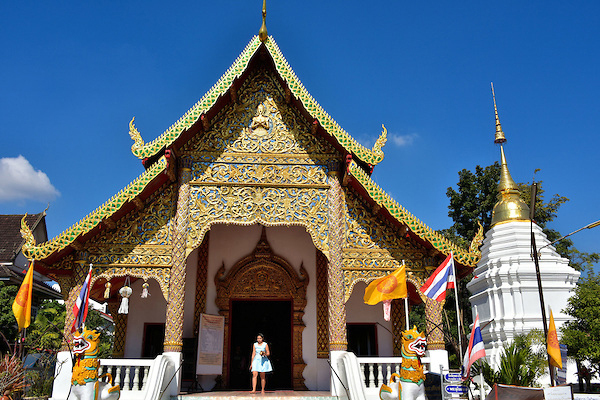 The Buddha within this shrine is considered the holiest statue in Chiang Mai. It came from the temple in India where Buddha achieved enlightenment. During the Songkran festival in April, the time of the Asian New Year, the statue is carried through the streets of Chiang Mai. People honor the image by sprinkling it with water. This year, Songkran takes place from April 13-15. 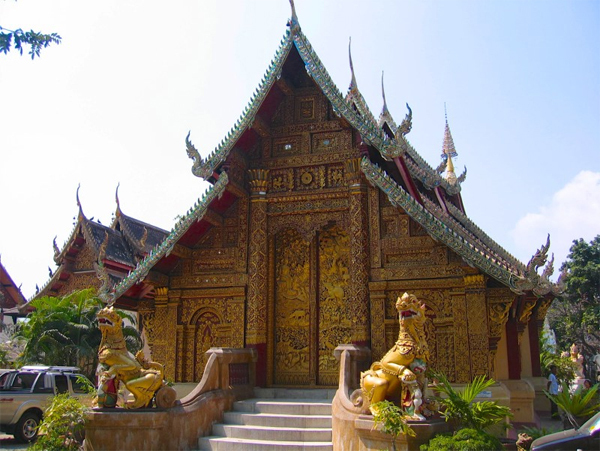 The temple of the Lion Buddha, or Wat Phra Singh, is commonly seen on postcards of Chiang Mai. Near this temple is a pavilion with wax monks and bowls to receive offerings. A gift to the temple entitles you to the inscription of your name on a roof shingle. To the left is a large white Buddha on a platform set with colourful stones. The main assembly hall has serpentine guardians and golden doors. Just beyond this is a parasol flanked by gold and silver monks. Behind them is a smaller hall guarded by golden serpents. To the right of the temple, in front of the police station, is a statue sure to bring tears to your eyes. An officer holds an injured child, with a second child pulling at his coat-tails. This service symbol is found on bumper stickers throughout Chiang Mai. This temple is a study in gold, with its glistening pagoda and adjacent dome. The building facade is clad in ornate golden scroll work. The Buddha statue within the temple is a favorite among Thai people. Inscriptions on images in three languages speak of the golden age of the Lanna kingdom. A dazzling white staircase leads to the temple entrance. During Songkran, a merit-making ceremony is performed. Sand is sculpted into small domes and decorated with flags in honour of Buddha. A burnished wooden wall borders this temple. Colourful flags surround the Sermon Hall. A carved wooden peacock perches over the door. Follow the dirt pathway to a flower-trimmed pond. You may also spot chickens roaming the grounds while hearing the sounds of chants and bells. The temple is called the Monastery of a Thousand Kilns as it was formerly used to hand-fashion Buddhas. Akin to a mountain, this temple rises boldly from the street. Shaped like a pyramid, it rests on a foundation of terraced brick. A long staircase climbs to the top. A herd of elephants encircles the temple halfway up the side. Within the shrine, long gold banners drape from the ceiling. Black and gold columns march toward the altar, honoring three golden Buddhas. At the southeast corner of the complex is a towering gum tree. Legend states that as long as the gum tree stands, Chiang Mai will have good fortune. A white chapel near the base of the tree enshrines a log from the original city pillar. Called an Inthakin, it is the focus of the Inthakin Festival in May. 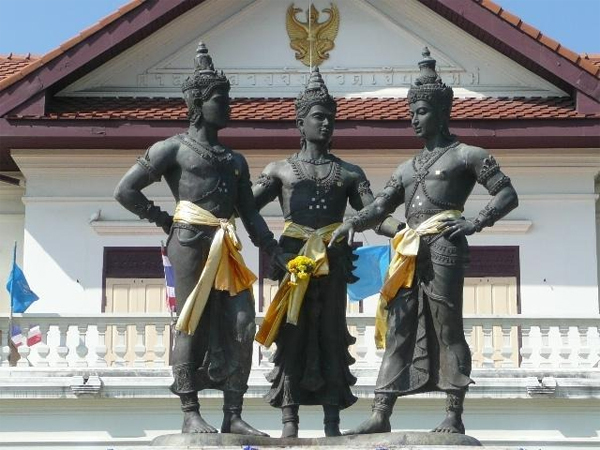 Originally, the pillar stood in the center of Chiang Mai. It was dedicated to the spirit of the city and is believed to protect her from evil and disaster. The huge brick shrine, known as the Great Stupa, is the tallest structure in the old city. It features a Buddha statue at each corner. In the eastern corner is a jade replica of the Emerald Buddha. Being within this temple, one feels truly blessed. A monk chat is an informal discussion with young monks seeking to practice English. Monk chats are held here daily from 9am-6pm. They are conducted at outdoor tables on the north side of the temple compound. Sit at a level below a monk with your feet beneath you out of respect. You can ask questions about Buddhism or daily life in the temple. Avoid interrupting while the monk is speaking. There is no cost to participate in a monk chat, but it is customary to offer a donation. A food court on Rachadamnoen Road hosts a trio of restaurants serving Thai, Italian, and Chinese fare. Hot Chilli is a hot spot among locals, with its red-themed decor and popular Thai dishes. The menu is clearly written in both Thai and English. Drapes in orange, red, and yellow billow from the ceiling. Lanterns and tassels dance in the breeze. Bench seats sway on flowered chains. Blossoms smile from silver planters. Seating options include sleek upholstered benches with red silk cushions. There are also rows of cozy tables. Open-air sections on two sides lend a cooling breeze. Service is attentive. Food is elegantly presented. Prices are inexpensive. The golden dome of Wat Phan On will take your breath away! This chedi is one of the most beautiful in all of Chiang Mai. The dome has red alcoves on all four sides bearing golden Buddhas. Next to the chedi is a prominent gong. The temple complex includes a large assembly hall and monastery. The hall is a two-story building with red and gold moldings around its many windows. The doors display fine wood carvings of mythic creatures. The second story has a red terrace bordered by a carved white fence. The courtyard houses a large tree and several Buddhas, sheltered by umbrellas. Numerous bells surround the temple. Visitors are welcome to ring them. There are picnic tables on the grounds and a small store selling food. The address of Wat Phan On is Ratchadamnoen Road, Soi 4, near Tha Pae Gate. 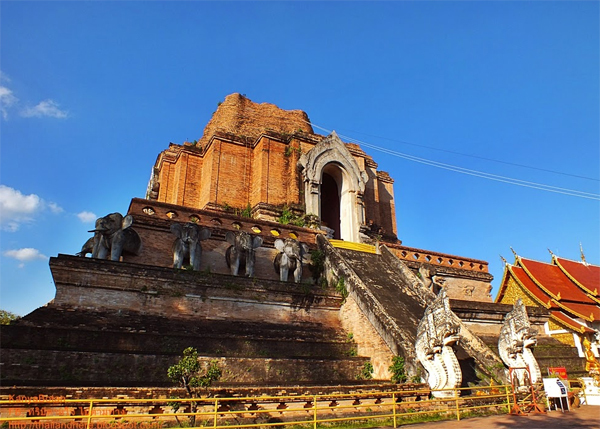 During the Lanna era, Tha Pae Gate was the main entrance to Chiang Mai. Staircases on each side of the gate lead to the top for panoramic city views. Lions surround the temple of Wat Mahawan. Golden dragons flank its entrance. The temple facade is decorated with intricate gilded scroll work. The doors display raised golden images of forest creatures. The compound includes two assembly halls, an ordination hall, scripture library, and chedi. At the main assembly hall, serpents curl from the tiers of the roof. Guarding the entrance are large white lions. An adjacent chapel is ornately etched in red and gold. Its arched doorway is crowned by a steeple. A frowning salamander stands before a second assembly hall. The entrance to the ordination hall is detailed in stucco flowers and mythic beings. The scripture library is a beautiful teak wood building. The chedi is a radiant white dome with gold-tipped spires. Each side of the chedi has a niche approached by a short stairway. Enshrined within each niche is an exquisite golden Buddha. Wat Chetwan has three unique chedis with elaborate scroll work. Two of the domes are cast in mythic Hindu creatures. The third is trimmed in coloured tiles that glisten in the sun. Guarding the main hall is a pair of yellow dragons. This is a stately temple fronted with a sheltered portico. Before the pillared entrance is a golden Buddha beneath an ornate parasol. Mythical beasts and beautiful maidens adorn the low walls of the temple complex. To the right of the temple is a small assembly hall. For a donation, you can receive a monk’s blessing and a yellow bracelet. 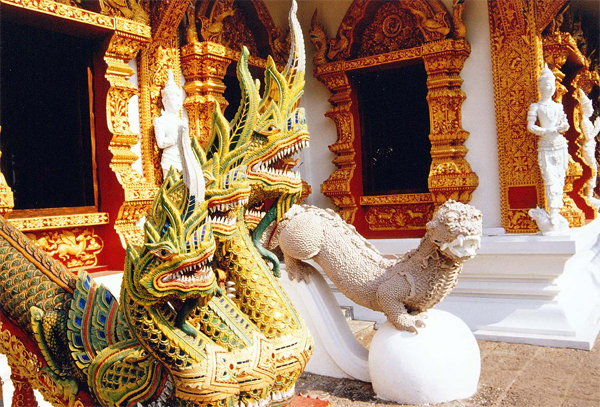 A narrow alley flanked by two serpents leads to the quiet garden of Wat Saen Fang. “Somewhere Over the Rainbow” describes the colour scheme of this complex. The spire of the main chedi is covered with multi-coloured, mirrored tiles. The ordination hall is notable for its bright red roof and doll-like statues. A bright yellow building is the monks’ quarters. The library facade has blue scroll work that shimmers in the sunlight. 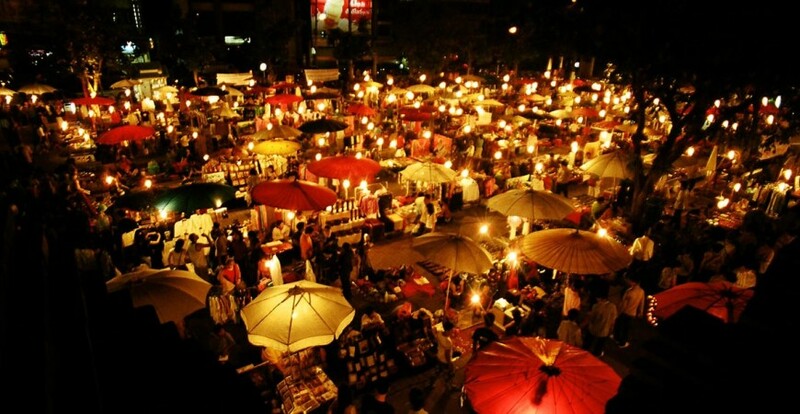 The Night Bazaar on Chang Khlan Road is an eclectic market featuring all manner of Thai goods. Beneath colourful umbrellas and sidewalk stalls are jewellery, handcrafts, clothing, belts, shoes, CD’s, and DVD’s. The Galare Food Center has an open-air dining terrace and free dance performances. On the south side of the Night Bazaar is the Anusarn Open Air Market with a wider selection of items, including electronics and designer clothing. The market is off Thanon Anusarn Sunthon, just beyond McDonald’s. It is customary to bargain for purchases at the Night Market. You can usually negotiate for 20-30% off an asking price. The market runs from 6pm-11pm. To become acquainted with Chiang Mai, walk her engaging city streets. Visit her wats, enjoy a monk chat, and receive a precious blessing. Some of the best food in Chiang Mai is street food. Especially worth a stop is Tong Tem Toh at 11 Nimman Road. A tour of the streets isn’t complete without a trip to the Night Market. 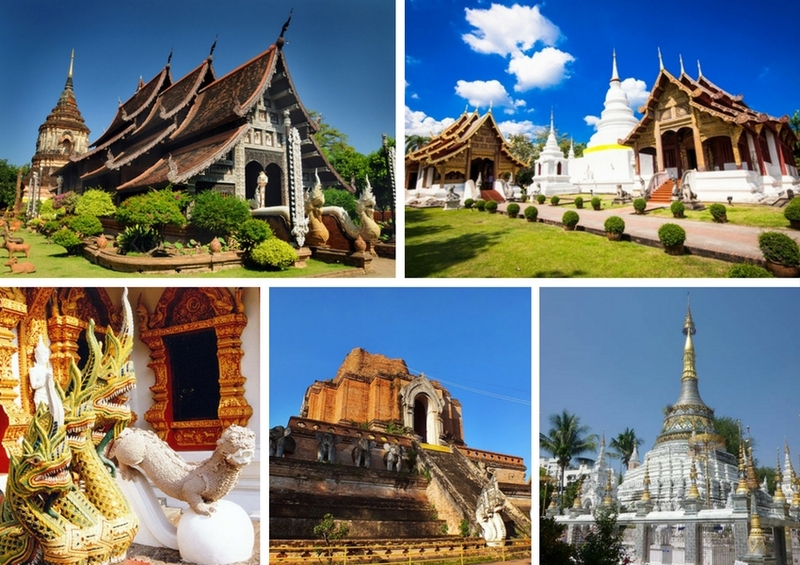 Enjoy the smiles of passersby and the splendor of Chiang Mai! akyra Manor is a five star boutique hotel in Chiang Mai, each suite created around a courtyard-within-a-room concept. It's the hip downtown hotel Chiang Mai never had. Check in to pure urban style and big city sophistication in the heart of this charming northern city's most buzz-worthy street Nimmanhaemin Soi 9, known locally as 'coffee street'. Take in the chic boutiques, galleries, bars and coffee shops, then return to your sanctuary and warm northern Thailand hospitality and the showstopping experiences of Rise rooftop bar and Chiang Mai's best new restaurant, italics. akyra Manor Chiang Mai offers 30 luxury hotel rooms for our guests, comprising 23 akyra Deluxe suites at a generous 60 sqm and seven expansive Manor suites of 100 sqm for guests who want to really have room to spread their wings. In addition to the expansive size of the suites, each of its bedroom is available for both king bed and twin beds settings, to serve various usages. Families with child under 12 are warmly welcomed.